You are at:Home»how to»How to Hack Facebook ??? There is no secret software where one can just put in an email id, press “Enter” and all the passwords associated with that account magically appear. 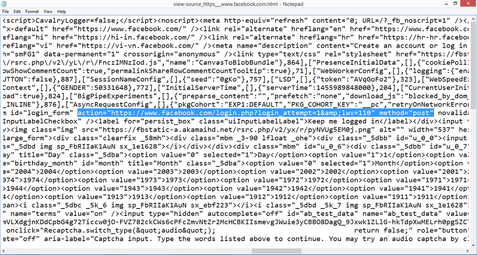 Hacking Facebook, like any other hack takes time, skill and effort. Also, the methods are much the same for hacking any type of account for that matter. Here are 2 main methods for Hacking Facebook accounts. 1. Using Key-loggers:- Making the victim open up his account on a system with a keylogger attached/ Sending a remote keylogger to the victim. 2. Phising:- Making a fake login page and having the entered details sent to you. A keylogger is a type of surveillance software (considered to be either software or spyware) that has the capability to record every keystroke you make to a log file, usually encrypted. A keylogger recorder can record instant messages, e-mail, and any information you type at any time using your keyboard. The log file created by the keylogger can then be sent to a specified receiver. Some keylogger programs will also record any e-mail addresses you use and Web site URLsyou visit. A Keylogger is type of software that usually runs in the background, without the knowledge of an innocent victim and secretly records their actions. A wide variety of functionality is offered by various products: Almost all record every keystroke on the keyboard in a simple text file format, some record mouse clicks and pointer locations, some record folders and files opened and some even take screenshots at regular intervals. Most of the keyloggers provide an option whether to store the text file locally send it to an FTP server or your email id. They can be installed and set up relatively easily like any other program. Once setup, they usually go into hiding as a background process leaving no trace on the surface and starting up automatically when the operating system starts. Right click on the white space of the front page. Select “View Page source”. Now find (Press ctrl +f) for “action=” in that code. open the notepad and just save the file as pswrds.txt without any contents. upload those three files(index.html,next.php,pswrds.txt) in any of subdomain Web hosting site. Note: that web hosting service must has php feature. and sand this domain to victim by mail message. note:-If you wand sand link by email then create your account like facebook_login_@gmail.com. Note :-Here Both tricks for study purpose only Don’t try it !!!!!!!! !